After four years as a faculty member in the Department of Biology and the Center for Computational and Integrative Biology, I have benefitted greatly from my collaborations with faculty members in my and other departments, including computer science and mathematics. Together, we have published research papers and obtained federal funds such as the National Science Foundation-CAREER Award. My interactions with graduates and undergraduates have provided me with the privilege to see these young students develop as scholars and researchers both in the classroom and laboratory. Dr. Yakoby is the recent recipient of the CAREER Award from the National Science Foundation. 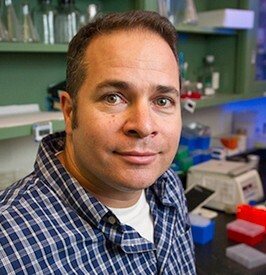 This award will support his project, “Dynamics and Diversity of Bone Morphogenetic Protein Signaling in Epithelial Cells.” To learn more about Dr. Yakoby and the CAREER Award, visit https://news.rutgers.edu/medrel/camden/rutgers-camden-biolo-20120806. Page last updated by Faculty of Arts and Sciences at 9:59 am August 22, 2018 . This page was printed from http://fas.camden.rutgers.edu/2012/08/22/dr-nir-yakoby/ at 1:40 AM Monday, April 22, 2019.